The garage is pre-eminently the domain of the man. In the garage are the car, and perhaps the engine. And in the garage a work bench has been set up where the hobby worker can do his thing. Of course, the garage is also for the storage of all kinds of things that we usually do not need so often. A garage is often a square block with little honor to be gained. But with the choice of the right garage door, the same boring square block suddenly gets a new face. There are different types of garage door and of course different types of material. In this article you will get to know about the possibilities regarding the garage door and how you make this part of the house stylish and fun to look at. You first need to discuss a number of materials of which a garage door can be made. You can of course base the choice of material on the material of the house so that it fits together a bit. Or you opt for something completely different so that it stands out. A common material for a garage door is metal. Here you again have a choice of different types of metal. The garage door is often used in galvanized steel. A metal garage door has the advantage that it is particularly strong and does not need much maintenance. Wooden garage doors provide the necessary atmosphere. It is about the same consideration you make whether you want wooden or plastic frames. Wood looks very nice of course, but also requires the necessary maintenance. In addition, wood is quite heavy and therefore not all types of garage doors are suitable for a wooden version. Wooden doors always need room to open, in contrast to a roller door, for example. Wooden garage doors will therefore often be double doors. 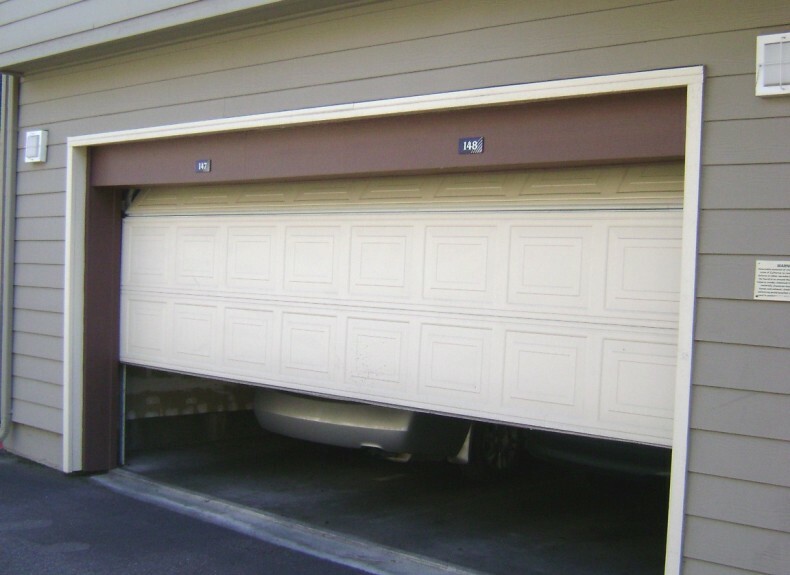 A roller door is a garage door that rolls up above the doorway. That can be in housing, or not. Logically, a roller door does not consist of a whole, but the door leaf is made up of a number of slats, or a rolled steel plate. A variant on the roller door is the sectional garage door. This is the same principle, only the ‘sections’ or the parts of the door are somewhat larger because they do not have to be rolled up. A sectional garage door bends but opens completely in the length of the ceiling. That is why these doors are also called overhead doors. There are two types of sliding doors for the garage. You have a side door, in fact a sectional door on its side. Then the door does not open towards the ceiling but along the wall. The advantage of this is that the door does not have to be opened completely if you want to enter. Then there is the traditional sliding door, which actually has a more industrial application. So you also see a lot of these types of doors at companies. The advantage of sliding doors is that they have limited headroom and no recoil. And you can use the full daily width. Opening garage doors are very similar to a regular door and also offer the convenience of it. They open quickly and quickly close again. Just store something in the garage or quickly grab something. This is only possible if access to this also allows. With some types of garage doors, it takes a while before they are far enough open to enter. You do not have that problem with French doors. You can also choose to open one door. If you need more space, for example to park the car, you just open the second sliding door. These professionals are happy to think along with you about your ideal garage doors. You have already checked out the different systems and different materials. If there is nothing in between, you can of course choose not to take a garage door at all. Do you have, for example, a very nice car that you prefer to watch all day long? Then an open garage can just be the right choice. You do have to deal with elements, so make sure there are no things that cannot stand. And make sure that it cannot rain too much inside. When you have to choose a garage door, it can be difficult to determine which door fits your home best. It is not only important that the appearance of the door matches the overall appearance of your home, but also that you choose the right door that fits the way you want to use your garage. Is it already starting to dazzle? Nice, then this article is perfectly tailored to your needs. With the above mentioned various options, you can buy the right garage door in a timely manner.